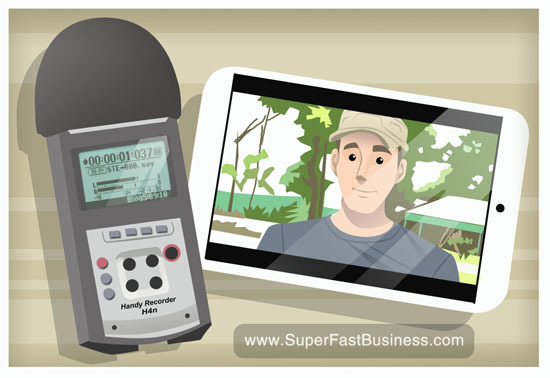 Wondering how you can do an audio video recording without heavy, bulky equipment? Watch this. You don't need bulky equipment to make quality video. 01:41 – The price myth. Should you follow the mystical rule of ‘7’? Take your already good business up a notch. Sign up for the next SilverCircle batch. James Schramko here coming to you with an Internet marketing news update. Now, I’m on location at the poolside at a hotel in Manila. We’re going to be talking about recording audio and video, a great app that I found, and also some conversion things you might want to be aware of. Our first topic is recording audio and video. I’m recording this video on an iPad mini, which is just suspended on the top of my laptop right next to my notes and I’m actually recording the sound separately. I’ll hold up the Zoom. This is my trusty Zoom H4. (You can also get a Zoom H1 ) It allows you to get much better sound quality and it’s the same one that I use with my Canon 60D when I’m at home. So if you are able to record video and audio separately and then bring them together in your editing software. I use ScreenFlow. It’s easy to line up the timecodes. I found that if you maximize the timeline, it’s pretty easy to get it exactly right, and then you go into editing. Now, a quick tip for the iPad mini, I found this great app called TiltShift video and it allows me to actually make some adjustments to the video before I import it into ScreenFlow. I can actually make a vignette which is a little bit dark around the edges. I can make a TiltShift focus which gets you sort of that blurred background like the 50mm lens does. And I can adjust the contrast and brightness so you should see me being able to actually modify some of these things with this video. The next topic I want to talk about is conversions and pricing. There are a lot of myths out there, like ending in 7s and stuff. Go and have a look at Amazon.com and have a look at their price of Kindles. You’ll see that they pretty much all end in 9. Surely Amazon would know about this law of 7s but perhaps they test and perhaps they know that that’s not the case. And I’m sure we’re probably making more profit now that we’re learning from people who compile the facts rather than just go with the wives tale. Now, final thing, a little cool animation. There’s an animation thing for your iPad or iPhone called miniatures. And it makes things look like a toy, so I’m just going to throw a little miniature effect here and you can see what it looks like. I hope you have a great week. I’ll be back to you next week. I’m James Schramko. Try these video tips and let us know, by writing on the comment box below, how it turned out.